It's been a while since I enjoyed a film this much. It's quirky and smart; I squawked all the way through, until the touching scene at the end, which caught me by surprise. Set in 1969 London, it's about two struggling actors, friends and roommates, who decide (possibly because their filthy kitchen is harboring vermin, or because of lack of sufficient food and booze) to escape to Uncle Monty's house in the country for a much needed holiday. Perfectly cast, and brilliantly acted by Richard Grant and Paul McGann, who play the roommates, and Richard Griffiths, marvelous as the intellectual gay, Uncle Monty. 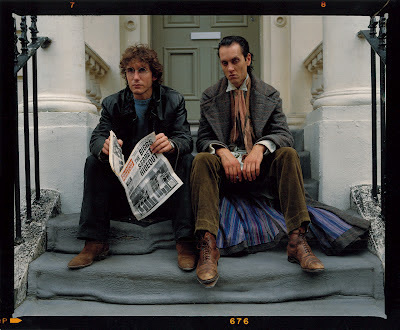 It's surprising Grant did not receive much deserved recognition for his role as the arrogant, condescending Withnail, who somehow manages, at the same time, to be quite adorable. The film plays out well because of director Bruce Robinson's deliciously dry, quotable lines. There are so many, and they fly so quickly, that each viewing will only get better. Also, great retro music throughout. It's now officially on my favorite films shortlist. This is one I'm going to want to watch over and over. I give it two woolly socks up, even in 90 degree weather. "We've gone on holiday by mistake." Oh sounds good- how/where did you find it ? thanks. I was wanting a new film to watch. thanks. That car........it happens to the best of us! Quite right. One of my all time favourites also. It was always a BIG cult movie in the UK. Willow dearest, I so enjoy your film reviews! Charming review -- now I have to find it! Oh, sounds delicious! My kind of film. Oh, gosh. I remember loving this movie. Thanks for the reminder! I always get the best movie reminders from you! It was produced by Working Title Films, a company funded by George Harrison. We've gone on holiday by mistake. A line I often use!!!! Oh yes Tess. Love IT!!!! I hope to see it! One of my favorite, favorite, favorite films. I dowloaded the movie last night from Netflix and watched. Great. I especially loved the old farmhouse which reminded me of Cold Comfort Farm. And the last scene at the zoo. I KNEW it was RAD who recommended it. Does RAD stand for radical? Also, I noted George Harrison's name and wondered if it was THE George. Guess so from the commentor. Suki, I'm glad you enjoyed it...yes... I wanted to move into the farm house...loved everything about it...the plaster walls...the inset windows...the little winding staircase...oh! By the way, Stainforth's R.A.D. stands for Ronaldo Antonio Dent. Okay, please tell me you read my very recent posts about this movie before you wrote this... you did, did you not? If not, this is the weirdest (or not) coincidence I've come across lately. 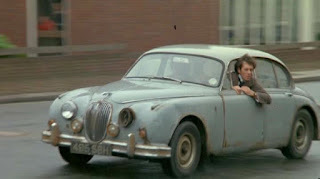 One of my most favorite films ever.Exactly my mispsent youth in a movie! Met Richard Grant in Marrakesh a few years ago.